Need to get a sports grant or looking to grow your club? My name is Gren Gale, I’ve been working with Bagshot Tennis Club as a volunteer for the last 4 years. We are a four court club and when I joined the committee we had 30 juniors in lessons, 70 adult members and almost no links to the community. The way I saw things, with so few juniors and an ageing adult membership, without change the club would cease to exist in 20 years time. To address this I put together a strategy to move the club forward. This was approved by our full committee in December 2013 and a whole raft of initiatives put in place that resulted in a growth of our juniors to around 150 and our adult members to 90 in less than four years. 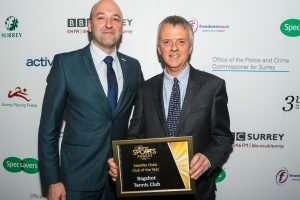 In October 2017 we won the Surrey Heath Sports Club of the Year award, quickly followed in December of that year by the Surrey Sports Awards Club of the Year. During that period I applied for and won 4 sports grants, the biggest of which helped resurface our wearing tarmac courts in artificial clay. As well as having experienced an unprecedented period of growth and success, the club is now beginning to generate surplus income from its activities and attracting sponsorship from commercial companies. I feel confident I can improve your club too, whatever your sport. I can help you find ways of increasing your membership and consequently your income and I can provide sports grants consultancy to help you win grants. I have a 100% record in winning grants I’ve applied for. I can’t guarantee that will continue, but I would emphasis that writing the grant application is the easy bit. Making sure you win is the tricky part and that is where most of my expertise comes in. We all want to attract more members, it makes the club more vibrant and brings in more income which allows you more flexibility. I can look at what you do now and propose new ways you can attract more members. What do I charge for this? For sports grants consultancy: If you’re a small club, I appreciate that you won’t have a lot of money to spare, so I’ll be happy to work on a no win no fee basis. I’ll only charge you if we succeed in raising a grant. If we don’t get the grant then I won’t charge you anything. The amount I charge will be dependent on the size of the grant and/or the work I need to put in, but I’ll let you know this at the start. If you’re a bigger club I may also be prepared to work on a no win no fee basis, but it’s more likely that with the sums being requested there will be a lot of up front work, so I’ll want to be paid an hourly rate. We’d need to discuss your particular situation and what you’re trying to achieve. For consultancy on how to grow your club where there is no target of raising sports grants: Again we’ll need to discuss this and I’ll provide you a quote for the work that you require.